Each week the Flower Guild displays beautiful flowers to Give Glory to God and bring focus to the cross during our services. 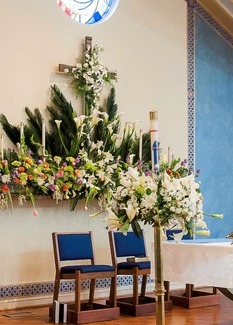 The altar flowers are dedicated to honor loved ones marking special life events such as birthdays, wedding anniversaries, baptism, confirmation, memory of a loved one, or a thanksgiving for life’s blessings. If you would like to sponsor the altar flowers, please sign up below. Your sponsorship will be announced in the weekly E-pistle and service bulletins. The cost for sponsoring altar flowers is $50 per family or individual and can be up to 5 sponsorships per Sunday. Please add "Flower Guild" in the memo of your payment.